Stuck inside of problems with the business blues again? Many see IT as application of technology to solve business problems. Of course, this is true but it leaves out the third element, which is to apply the right architectural pattern to solve the problem. For example, when the business problem is that reporting is slow and reports from different departments don’t match, the astute IT professional immediately thinks in terms of a data warehousing pattern employing technologies like databases, extract-transform-load (ETL) tools, and multi-dimensional reporting suites. 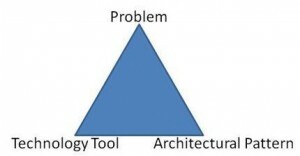 A strategy based on the tools alone may solve the immediate problem, but understanding the solution-pattern enables the IT professional to bring to the business the additional benefits that come with the pattern, organizational and IT support impacts, and any risks that might emerge by applying the pattern. In the data warehousing case the informed architect might cite improved executive dashboards and ability to drill down to root causes from summary reports, the need for data stewardship, and potential long term increase in data storage capacity needs. Beyond that, when the architect lacks the pattern approach he or she seems to the business person like Bob Dylan’s debutante: “Your debutante just knows what you need, but I know what you want.” On the projects I’ve been on where designers lacked a pattern-based perspective the technical team did exactly what the business folks said they wanted, but for the most part didn’t contribute to the business value of the solution. On projects like this developers slavishly ensure the solution matches each and every requirement, rarely bring to the table new business requirements that are logical consequences of the design, and tend to avoid questioning defined requirements even if they are contradictory or counterproductive. Sure, patterns aren’t strictly necessary. An outstanding architect can design from whole cloth an original solution that precisely matches business need. However, that’s not how outstanding architects do business, at least the ones I’ve known. In my experience the best IT architects know patterns, like data warehousing, SOA, and others, well enough to match the business problem to the right pattern and then evolve the architecture from the generalized pattern into a problem-specific architecture based on the particulars of the business problem at hand. Some examples of common solution patterns in the world of business IT are Data Warehousing, Master Data Management, and Service Oriented Architecture (the Wikipedia article on this one is preliminary at this writing but still a good intro for the uninitiated). Those interested in a more technical introduction to patterns might start with Avel Avram’s quick intro at InfoQ (Membership at InfoQ is required but free and worthwhile). This entry was posted in IT and tagged Alignment, Architecture, Requirements on September 17, 2009 by Bob Lambert.